Renske fan e Olde Hoek - "Renske"
The Friesian is a medium- heavy breed (Stallions 158cm minimum -166cm, Mares 155cm minimum -164cm) with an average weight of approximately 550kgs for Mares and 650kgs for Stallions. Lighter than the heavy breeds such as the Percherons though more solid in build than breeds such as Arabians and Thoroughbreds. The only acceptable colour for a Friesian is solid black, though it is not uncommon for the coat to appear reddish at times due to sun bleaching. This is particularly noticeable around the head and flanks. The main distinguishing features are the long luxuriant tail, heavy mane, light to medium feathering below the knees, the distinctive natural raised head carriage and the soft expression from large round eyes. The head is described as "Noble", not too long and with ample breadth. Small attentive ears, with ear points inclining somewhat to each other. The neck is slightly curved with a crest, not too short or poorly muscled. Strong "dry"; legs, not too long in body with well-muscled, slightly slanted croup. The 'Black Pearl' as he is respectfully known in his native land, the Friesian horse is one of the oldest breeds in Europe traditionally used as an all-purpose horse by the Dutch farmers. One of the earliest recordings of the Friesian was by the Roman historian, Tacitus (AD55-120). The Friesian and German Knights on their quest to the crusades also used Friesian horses as mounts. Since the early 1900's the Friesian horse has been developed into a more athletic type, which is taller and of lighter build than the traditional horse. These days the modern Friesian is a highly prized carriage and dressage horse measuring 158-165cm with regal appearance, flamboyant action and exceptional temperament. Its desirable traits have contributed to a somewhat fanatical following worldwide. 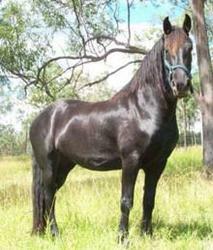 Its black colour, long heavy mane and conspicuous fetlocks are typical of this trusty steed. Its friendly but lively character, as well as its intelligence and eagerness to learn make it possible to use the Friesian horse for many applications. Not only have they been used as coach horses, driving and show driving horses and riding horses, but they are also ideal for dressage and recreational riding. The Friesian has also had an impact in developing a number of other breeds, some of which are: Shire, Oldenburger and the Dale and Fell Ponies. Friesians have a friendly, easygoing nature. The even temperament of Friesian's is often considered one of their most admirable traits. Friesians are suitable for both the experienced and not so experienced owner. Their temperament makes them particularly easy to manage though being a large animal they do require the appropriate amount of respect. Friesians are particularly good doers. The protein requirements for Friesians are lower than most breeds (approximately 12%). In their native land they are mostly fed on grassy hay with lower protein levels and high levels of roughage. They also benefit from small amounts of good quality hard feed or pellets. 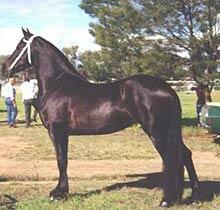 Friesians are suitable for most equine activities with the possible exception of show jumping. Their rather solid build could lead to leg and back injuries over time, in this sport. They excel as carriage horses, dressage horses, in the show arena and as a pleasure horse. The only registering body for purebred Friesians in Australia is the Australian Friesian Horse Society (AFHS), which is the Australian affiliated arm of the Dutch Studbook the FPS. 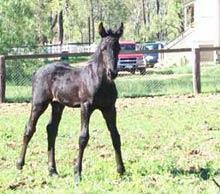 Horses must be fully registered in the main studbook of the FPS if their offspring are to be registered with the FPS. Registration status greatly effects the purchase price of Friesians and should be looked into if you are wanting to breed from you Friesian. Friesians can be expected to live to 22-25 years of age. Friesians are generally a healthy breed though can be prone to any of the normal equine related diseases and health issues. Due to the rather limited gene pool worldwide, it is wise for prospective buyers to request an official "inbreeding co-efficient" score prior to purchase. The desired score is 5.0 or below. This indicates the closeness of the breeding lines behind the horse and whilst it is not an indicator as to the quality of the horse it is useful if you are intending to breed from your Friesian.